A remake of the classic game Black Cauldron. You play the part of the young Taran, Assitant Pig-Keeper of the great sage Dallben. Your quest will be to keep the oracular pig Hen Wen safe from the forces of evil and to eventually destroy the evil Black Cauldron. "Some annoying bugs aside, this is a solid translation of the original Black Cauldron pc game to AGS." Also contains game source project (made in AGS 2.7). Always really nice to play an old classic, and a little bit easier with the point and click interface. 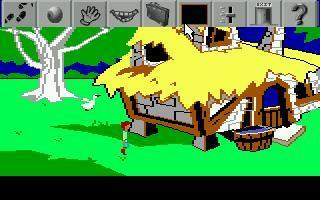 It's amazing how many times you can fail/die in these old adventure games! Its a pretty good game. Igot frustated with it quite a few times, and i did finad a few bugs, but besides that it was a fun game. I would give it a 94% over all.